Ahoy, ye cheesy pirate talk! This guide is all about Petpet Cannonball, the only game where you're allowed to blast a bunch of Petpets out of a cannon with the chance that they'll smack into a pole, barrel or whatever else is in their path. What you want them to go through, though, is the bottomless bucket in the game so that they'll slide down a blanket to comfortable safety. Yes, the game isn't called Petpet Cannonball for nothing. 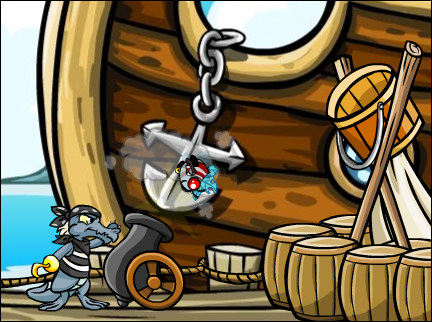 Apparently a group of pirates were once out of cannonballs for shooting practice, so they all grabbed their Petpets and started using them. It became an international phenomenon and a game on Neopets, obviously. Just don't ask whether or not the PPL approves the playing of this game. The gameplay is simple: you use the arrow keys to move the cannon's barrel up and down and you press the space bar to fire. The longer you hold the space bar in, the more power you're putting into the cannon; the higher you tilt the cannon, the more power you need; the Petpet will shoot out faster and longer with more power. Points are given based on how many tries it takes you to get the Petpet through the hoop (that previously-mentioned bucket with no bottom); added to that, you start with only ten lives. With each successful shot you get an extra life (up to a maximum of ten), but with every misfire a life is taken away. Make every shot count! Can he make it? Can he make it? Though the game is actually labeled as an action one, it should be puzzle; to accurately fire, you need to calculate the Petpet's weight and the trajectory of the cannon to find out at what angle and how much power is needed to get the Petpet into the hoop. Translated, that means you should practice guessing at what power to put into the cannon for each Petpet; aim carefully, too. Remember: the heavier the Petpet, the more power you need to shoot it, and the more points you get for a successful shot. Here's a chart of all the Petpets in the game and how much they weigh. The Pirate Tenna is a special case--its weight doesn't really affect its point value; rather, it will always be worth 20 more points than whatever the Snowbunny is worth on a particular level. Every three successful shots, you'll go to the next level; the difference is that the hoop is higher up, the cannon has been pulled back a bit and the power meter will go up slightly faster. In the later levels, it makes it a lot tougher. In the very first shot of every level, you'll be given a dotted line with which line up your shot with. When that line is lined up right before the back of the bucket, you're almost guaranteed a dunk. You'll only get eight of them, though, as the game ends when you finish level eight. To estimate the angle of the cannon, try to get it parallel to the pole at the front that is holding up the bucket. Or if you find it easier then try to find a spot in the background as a reference point; like maybe pick one of the differently shaded marks in the wood of the ship and use that to line up the lip of the cannon. Before the game ends after the eighth level, though, the masters of the game apparently achieve their high scores by managing to shoot in one last Petpet before they get the Game Over screen; thanks to Ryudaaku for that hint. Keep your fingers crossed that the Pirate Tenna will show up (it can make multiple appearances if you're really lucky) and be sure to dunk any that do. Also, as Doodlebug points out, since the heavier Petpets give more points they should be your priority. Once you get better at estimating the angle and power necessary to get each one through the hoop at each distance you can become more selective of which Petpets you dunk and which you ditch. If you feel confident enough in the final level, then, you can choose to miss on purpose with some of the lighter ones in hopes of being given a heavier Petpet next time, which will give you more points if you get it through the hoop. So, have fun blasting all of those Petpets through a bucket! Try not to hurt them too badly. Bye!